The edible oils industry in the Middle East has, over the years, witnessed considerable investment, which has resulted in a significant rise in workforce, number of factories, and total production capacity. 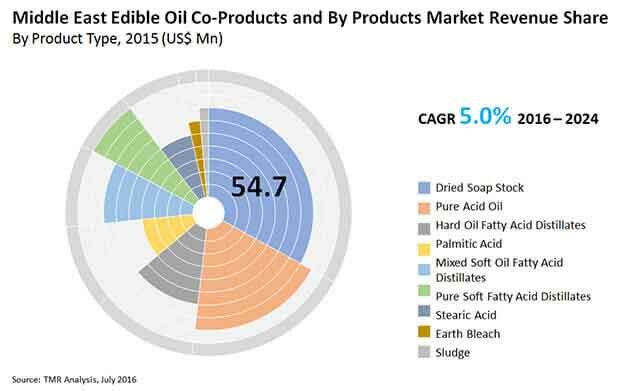 The edible oil co-products and by-products market in the Middle East has benefited from these developments and from the growing affluence and rise in population in the region. In terms of value, the market is poised to expand at CAGR of 5.0% from 2016 to 2024. The demand for edible oil co-products and by-products is set to increase from 388,944.3 tonnes in 2015 to 559,775.89 tonnes, registering 4.2% CAGR therein. Consumers in the Middle East are constantly seeking new tastes, flavors, and applications and companies in the edible oil co-products and by-products market have been devising strategies around this trend to stay competitive. By product type, edible oil co-products and by-products are segmented into dried soap stock, hard oil fatty acid distillate, pure soft oil fatty acid distillate, mixed soft oil fatty acid distillate, pure acid oil, palmitic acid, stearic acid, sludge, and earth distillate. Dried soap stock is projected to be the leading segment in the Middle East market for edible oil co-products and by-products in terms of value as well as volume. The market for dried soap stock in the Kingdom of Saudi Arabia is likely to grow considerably during the forecast period owing to the increasing utilization of this co-product in animal feed. The soap produced from dried soap stock is biodegradable and is widely used as anionic surfactant in powder detergents. Mixed soft oil fatty acid distillates are anticipated to exhibit a strong CAGR by volume and value during the forecast period of 2016 to 2024. Based on country, the Middle East edible oil co-products and by-products market is segmented into the Kingdom of Saudi Arabia, Iran, Egypt, Sudan, Morocco, Algeria, and Turkey. The oil and soap industry is one of the oldest and most important industries in Egypt. There is a high demand for dried soap stock in the country as it reduces the expense of raw material required for soap manufacturing and provides several economic benefits. Stearic acid acts as an emulsifying and thickening agent when used in cosmetics. With the growing middle-class population in Egypt, the demand for personal care products is rising, which is projected to push the demand for stearic acid in Egypt during the forecast period. The market for dried soap stock in Saudi Arabia is set to rise over the course of the forecast period owing to the extensive use of this by-product for the production of soap and detergents and as an animal feed ingredient. Iran is a leading producer of soaps and detergents and there is immense potential for the growth of the dried soap stock and pure acid oil markets in the country. Egypt and Morocco are anticipated to witness considerable growth for fatty acid distillates in the Middle East. The demand for hard oil fatty acid is comparatively higher in Turkey than in any other country in the region, driven by the increasing production of soaps and detergents and the rising disposable income in the country. Some of the prominent players in the Middle East edible oil co-products and by-products market are VVF L.L.C., Cayman Chemical Company, Rade Chemicals, Chemipakhsh Iran Co. Ltd., Mallinath Group, A & B Chemical Corporation, Iran Chemical Provider Co., Genome Specialities Fzc, Oleo Misr, and Arabian Environmental Protection Co. LLC. Dried soap stock adds nutrient value as feed improves pelletizing and provides flexibility in utilization and processing. It is often treated with a strong mineral acid and is converted into a crude mixture of fatty acids, known as acidified soap stock. This mixture is widely used as a calorific component in animal feed. However, factors such as increasing feed prices, food shortages, and shrinking water resources are likely to hinder the growth of the dried soap stock market in KSA. In addition, pure acid oil is cheap and acts as a good source of biodiesel. Both palmitic and stearic acids add hardness to soaps and is widely available in Saudi Arabia. The market for both the acids is expected to develop further in the future. Moreover, increasing concern towards prevention of various diseases coupled with low price of dried soap stock is likely to fuel the growth of this market in Saudi Arabia during the forecast period. Due to increasing environmental concern, there is huge demand for eco-friendly, biodegradable products with natural ingredients. Thus, dried soap stock is likely to find extensive application in soaps and detergents. In addition, Consumers have strong hygiene habits and are focused on preventing the spread of virus and bacteria. Thus, there is huge demand for soaps and detergents in Saudi Arabia, which in turn is likely to accelerate the growth of the dried soap stock market. Furthermore, The market for soaps and detergents in Iran represents an enormous and developing market in the Middle East. The strength of the dried soap stock industry is demonstrated by strong growth in the production of surfactants, household detergents and other raw materials in recent years. Moreover, factors such as increased competition in the private sector, consumer demand, and favorable government policies have resulted in introduction of new products with significant improvements in quality and performance.